Fairfield Park was one of the first places that the wild black squirrel was spotted in 1912 and has been spreading throughout the area since. Dr Alison Thomas, a professor of life sciences of Anglia Ruskin University, conducted a number of genetic tests to work out the background of the new squirrel Her research was widely reported in the national press and on the BBC in January 2009. It had been thought that British black squirrels, who appear to be more aggressive than the greys, were a mutant produced by two grey squirrels mating.However scientists looking at the growing population in the eastern counties have found that the black squirrels are in fact an introduced subgroup that escaped from a menagerie of exotic animals in the east of England more than 100 years ago. The latest estimates show there could be as many as 25,000 in the east of England. Around Hitchin and Letchworth the black squirrels already outnumber greys and could be dominant throughout the eastern counties in the next 20 years. 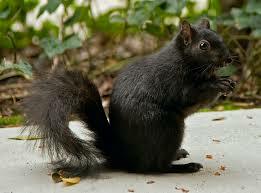 Dr Thomas found that the DNA was exactly the same as black squirrels found in the US. It would be almost impossible for exactly the same genetic mutation to have happened in the UK, therefore the black squirrel is probably imported. She said: “It had been argued that the black squirrel was the result of a genetic mutation caused by two grey squirrels mating and producing black offspring. Finally we have quashed this. Genetic tests revealed the British black is a direct descendant of the American black. “It took just one cheeky squirrel to escape a zoo and mate with a grey. Now there are tens of thousands in the UK. Dr Thomas believes the original squirrel would have been bought over by a wealthy Victorian landowner following the trend of introducing new species to the UK. She said it may even have been the Duke of Bedford who owned Woburn in Bedfordshire. Grey squirrels were also introduced to the UK by the Victorians and have now almost wiped out the native red squirrel population in the UK. Dr Thomas said the black squirrel may do the same in the eastern counties. However, whereas the grey was bigger than the red and carried a pox the differences between the black and grey are more subtle. Although the black appears to be more aggressive than the grey, it is the same size and is the same species. The gene that causes the black colouration in squirrels could also be linked to higher testosterone levels — and there is anecdotal evidence that the black squirrels are more aggressive and successful as mates — however there is no proof of this yet.